CAMDEN — A New Members’ Coffee was held Tuesday, Aug. 14, at the home of Camden Garden Club Membership Chair Molly Foster. In the delightful waterfront setting, Brian Crawford-Green, Berna Cummins, Ruth Ellison, Sandy Hurlbut, Deb Lyon, Elizabeth Selfridge and Cathy Ward were welcomed into the club. Unfortunately the eighth new member, Susan Reider, was unable to attend. 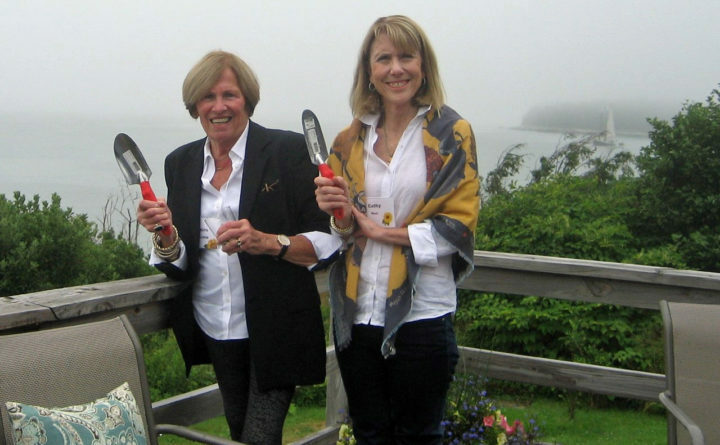 After enjoying a delicious array of refreshments provided by the board members, the newcomers took turns sharing their reasons for joining the club, and each received a specially selected garden tool. Camden Garden Club meets the fourth Thursday of each month, April through October, and also hosts a Winter Horticulture Program at Camden Public Library in January and February. The annual House & Garden Tour, the club’s major fundraiser, is held in July. Anyone interested in finding out more about the club and its activities can visit www.camdengardenclub.org or email camdengardenclub100@gmail.com . Camden Garden Club is a member of the Garden Club Federation of Maine and National Garden Clubs, Inc.